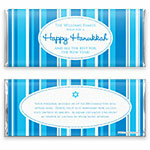 Simple yet sweet, this classic wrapper design will bring a touch of whimsy to your Hanukkah celebrations. 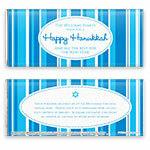 Design: Vertical stripes in different shades of blue with oval text frames. Personalization: Front greeting and message, back message.